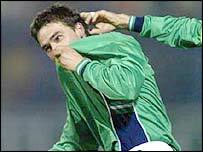 David Healy's superb strike against Estonia in Tallinn gave Northern Ireland their first win in 16 games. They had not claimed a victory since winning 1-0 in Malta in October 2001 when Healy scored from a penalty. Healy's 10th international goal came when he curled a magnificent shot into the net in first-half injury-time. The Preston man missed a great chance to add to the lead in the second half when he fired over from six yards after Jeff Whitley's shot had been blocked. Healy, who last month ended the province's miserable scoring record stretching over more than 1,298 minutes, was quickly into the action. He tried his luck from 25 yards in the second minute, only to see his shot go narrowly wide. Then the impressive Steve Jones latched onto a poor Estonia clearance but was off target with his effort. In the 16th minute, Estonia goalkeeper Martin Kaalma had to save twice in quick succession from Whitley and debutant Tony Capaldi. Estonia broke away after 25 minutes but Mark Williams timed his tackle to perfection to dispossess Indrek Zelinski, winning his 100th cap. Northern Ireland were playing with plenty of spirit and Phil Mulryne floated a free-kick narrowly over the bar in the 40th minute. Then Stephen Craigan saw a goalbound header turned away at the back post by Raio Piiroja. The goal came two minutes into first-half stoppage-time with Healy taking a sweeping pass from Jones in his stride to curl a shot beyond Kaalma from 20 yards. Jones produced a fine run early in the second half but his final shot from the edge of the box was just wide. Healy should have added to the lead in the 63rd minute but he blasted over the top from close range after Whitley's shot had been unconvincingly parried by by Kaalma. Two minutes later, the industrious Whitley had another half-chance for the Irish but he pulled his shot just wide from the edge of the box. The Irish had little difficulty in maintaining their advantage to their finish. Estonia's only chance of note in the second half came in the 80th minute when Maksim Smirnoff fired wide after a rare moment of sloppiness in the Northern Ireland defence. Estonia: Kaalma, Jaager, Stepanov, Piiroja (Rahn 81), Klavan, Reim, Smirnov (Reinumae 85), Kristal, Zelinski (Teever 64), Meelis Rooba (Lindpere 73), Kink (Terehhov 71). Subs not used: Kaas, Purje, Saviauk, Dmitrijev. Northern Ireland: Taylor, Baird, Williams, Craigan, Capaldi, Jones (McCann 68), Whitley, Sonner (Duff 78), Mulryne, Healy, Smith. Subs not used: Fettis, Toner, Kirk. "Northern Ireland were always in control"